Our historic hotel is located in the heart of Atlanta Midtown, where it takes its soul-infused design from the Fox Theatre located directly across the street, and places our guests just steps from countless local gems. Guests and locals alike mingle on our patio and in our bar, where you can feel the energy and rhythm of our neighborhood. Our pet-friendly hotel even has its own live-in furry resident, Indie. With vibrant, colorful hues, elegant furnishings and an inspiring, artistic flair, the Hotel Indigo® Atlanta Midtown hotel is no ordinary hotel. Welcome to the DoubleTree by Hilton Hotel Atlanta Downtown. Begin your stay at this inviting hotel with a warm welcome and a delicious DoubleTree chocolate chip cookie. Conveniently located in downtown Atlanta, only a few blocks from MARTA Peachtree Center, this modern, boutique-style hotel is within walking distance to a number of Atlanta attractions, including Georgia Aquarium, the CNN Center, Philips Arena and the Centennial Olympic Park. Corporate travelers will appreciate our proximity to the Georgia World Congress Center - the 4th largest convention center in the United States.Relax in a stylish guest room or suite at this downtown Atlanta hotel. Each of our guest rooms feature tasteful decor and modern conveniences, including WiFi, 32-inch LCD TVs, elegant bathrooms and spacious work desks.Savor tempting American classics in the hotel's stylish and inviting Aura Restaurant or join friends or clients for an expertly mixed cocktail in the contemporary Liquid Lounge. Maintain your exercise regimen in the complimentary fitness center or swim lengths in the outdoor swimming pool.With an onsite business center offering a range of services and amenities and over 14,000 sq. ft. of meeting and banquet space, all with WiFi and the very latest A/V equipment, this downtown Atlanta hotel is the ideal venue for hosting a social or business event. Our professional staff is on hand to assist you and ensure that your event is a success. 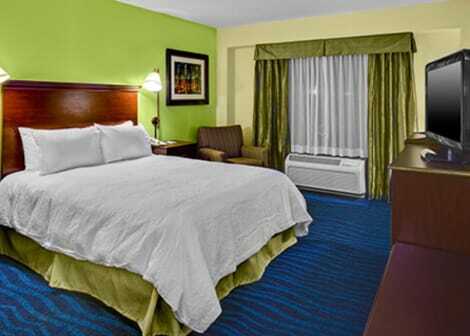 Stay at the Embassy Suites Atlanta – at Centennial Olympic Park hotel in downtown Atlanta, Georgia, eight miles from Hartsfield-Jackson Atlanta International Airport. Relax in a sleek, contemporary two-room suite with high-speed internet access, available for a nominal fee. Every suite contains a 32-inch flat-screen TV in the living room and the bedroom, with cable and pay-per-view movies. Accessible rooms are available in our downtown Atlanta hotel.Start your day with a complimentary cooked-to-order breakfast. Mingle with fellow guests while enjoying our nightly Complimentary Cocktails* and light snacks. Choose from 14 elegant event venues for your business meeting or social event. Take advantage of the hotel’s BusinessLink™ Business Center and A/V equipment rental service. Catering is provided by Ruth’s Chris Steak House.Exercise in the fully equipped Embassy Suites Fitness Center, and stay fit and toned by swimming in the hotel pool, open seasonally. Sample carefully selected steak and amazing desserts at Ruth’s Chris Steak House. *Service of alcohol subject to state and local laws. Must be of legal drinking age. InterContinental® Buckhead Atlanta offers sophisticated business and leisure travelers a host of quality facilities. Southern hospitality is assured in our unique event spaces, including two opulent ballrooms and the breathtaking Windsor Garden. Reconnect with a range of holistic therapies and treatments from around the world at Jurique Spa. Let award-winning chef Art Smith astonish you at the hotel's exquisite Southern Art restaurant, followed by a nightcap of fine whiskey at Bourbon Bar. 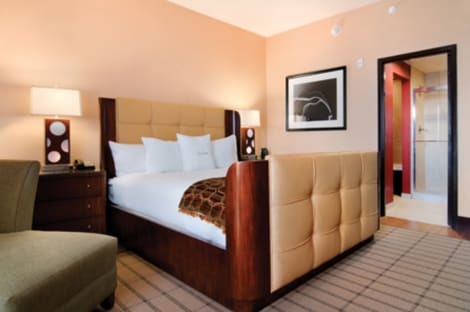 Welcome to Home2 Suites by Hilton Atlanta Downtown, a modern hotel with historic charm. Set on the edge of Centennial Olympic Park, our hotel is a quick walk to government buildings and corporate offices and steps from World of Coca-Cola, the CNN Center and Georgia Aquarium. Pro sports fans will love our location near the Georgia Dome for Falcons football and Philips Arena for Hawks basketball. Hartsfield-Jackson Airport (ATL) is just 10 miles away.Opened in 1917 as an office building, our new all-suite hotel retains its historic look and impressive architecture, including terrazzo floors and marble stairs. Suites are quaint and smartly designed spaces with movable furniture, a full kitchen, ergonomic workspace, a living area with HDTV, and tall windows for gorgeous views of downtown. Check email with free WiFi, and bring your pets along to our extended-stay hotel.Start the day right with a free Inspired Table™ breakfast, including waffles, oatmeal, yogurt and breakfast sandwiches. Our unique Spin2Cycle fitness and guest laundry facility is open 24 hours – run the washer while you run the treadmill. Unwind after a long day on our rooftop patio with endless views of the city. Our Atlanta hotel also has a Home2Mkt convenience shop, 24-hour business center, and meeting space for up to 30 guests. Be close to Perimeter Center when you stay at the completely renovated DoubleTree by Hilton Atlanta Perimeter Dunwoody. 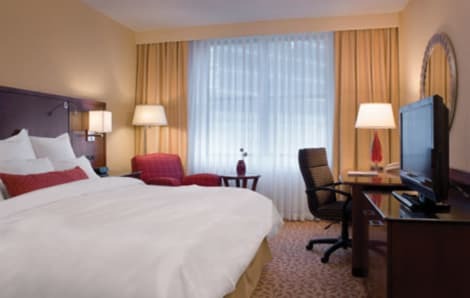 Our hotel is convenient to Fortune 500 businesses such as Cox Enterprises, UPS and Home Depot plus upscale shops, Atlanta attractions and sports arenas. To help you get there, we operate a complimentary shuttle to the MARTA station and other stops within 5 miles of the hotel. Savor our signature DoubleTree chocolate chip cookie before your work or play begins.Our event-savvy hotel provides 10,000 sq. ft. for your Atlanta meeting or wedding, only 24 miles from Hartsfield Jackson International Airport. Expect inspired service and business center support when you reserve one or more of our 11 meeting rooms. The ballroom is perfectly sized for a grand wedding reception.This Dunwoody hotel has dining options that suit your schedule. Savor authentic Southern barbeque at our restaurant, which also serves breakfast, lunch, dinner and room service. The convenience market is always open for snacks. After indulging in delicious food, work off extra calories in our fitness center or just relax in the heated outdoor pool.All of our freshly renovated accommodations include free WiFi and a workstation. Need extra room? 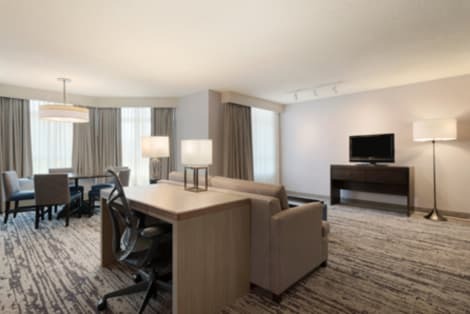 Each of our Atlanta suites is designed with a separate living room, conference desk and an extra half bath. 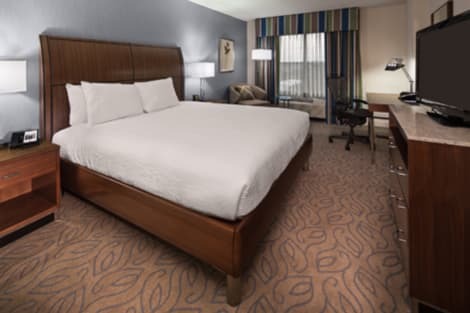 We offer accessible rooms, too.With all of this convenience, you’ll know we have you in mind when you stay at DoubleTree by Hilton Atlanta Perimeter Dunwoody. 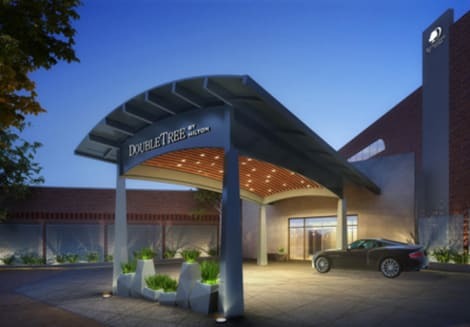 Welcome to the DoubleTree by Hilton Hotel Atlanta - Northlake, located in the Atlanta, Georgia suburb of Tucker. Our northeast Atlanta hotel is 25 minutes from Hartsfield-Jackson Atlanta International Airport and offers easy access to I-285 and I-85. Downtown Atlanta is 15 miles away.The hotel is within walking distance of restaurants, shopping and entertainment, and minutes from major corporations such as Hormel, Sherwin-Williams Company, Kroger Company, the CDC, FEMA and IRS.Retreat to a spacious guest room or suite featuring signature bedding and a 32-inch LCD HDTV with premium cable. Stay connected with high-speed internet access and be productive at the work desk. Suites feature wood laminate flooring and a separate parlor with sofa bed.Relax in our inviting lobby and listen to the waterfall or play a favorite video game. Savor classic American cuisine for breakfast, lunch and dinner at Marlow’s Tavern. In-room dining is also available. Maintain your exercise regimen in our fitness center or swim laps in the outdoor pool.Our hotel offers 10,000 sq. ft. of event space for your business meeting or special event, from a boardroom that accommodates 10 guests to a ballroom accommodating 400 guests. Conduct business or check your email in our business center, which also complimentary printing.Explore the Fernbank Science Center, Underground Atlanta, the Martin Luther King Center, Stone Mountain Park, Six Flags Over Georgia and many other attractions near our Atlanta hotel. Located in Atlanta, The Highland Inn is in the historical district, within a 10-minute drive of Fox Theatre and Emory University. This hotel is 3.5 mi (5.6 km) from World of Coca Cola and 3.6 mi (5.8 km) from Georgia Aquarium. Welcome to the new Hotel Indigo® Atlanta Vinings. Escape to our unique, boutique style hotel with unexpected touches that reflect the distinct charm and character of the historic Vinings neighborhood. From the artwork on the walls to the elegant furnishings, our staff welcomes you to enjoy a refreshing and inviting guest experience. A step above all other hotels in Atlanta, we offer convenient access to I-285, I-75, and US 41, making travel to top area attractions, including Six Flags and the Georgia Dome, a breeze. For leisure travelers, our hotel is located just miles away from the future home of the Atlanta Braves, SunTrust Park, scheduled to open in 2017. Enjoy easy access to premier shopping at the Vinings Jubilee, performances at the Cobb Energy Performing Arts Centre, and the vibrant nightlife of Buckhead. 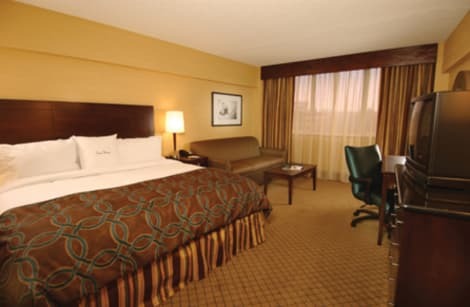 Business travelers will benefit from the close proximity of the hotel to many nearby companies including Home Depot HQ, Nissan, Sandvick, Dobbins Air Reserve Base, IBM, and the Cobb Galleria Centre. Feel right at home in a spacious guestroom featuring plush bedding, spa-inspired bathrooms, hard surface flooring and complimentary wireless internet. Flexible event space is available with full service catering for your next meeting or wedding. Let the Hotel Indigo Atlanta Vinings inspire you with the perfect blend of southern hospitality and modern day sophistication that guests call welcoming and surprisingly unexpected. Enjoy the great location of the Hilton Garden Inn Atlanta Midtown hotel, just off the 10th Street Exit in the heart of Midtown Atlanta and only 13 miles from Hartsfield Jackson International Airport. 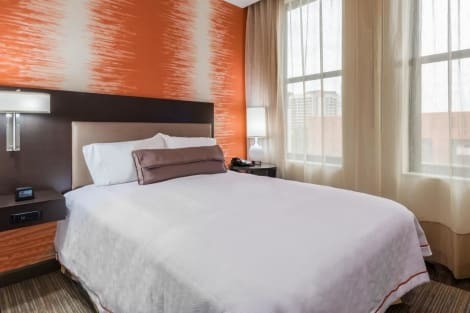 Our proximity to the Midtown MARTA Station and the Downtown Connector makes travel round the city simple.Prepare for tomorrow in a comfortable guest room with useful amenities and great technology. Check email with complimentary WiFi, get on with work at the desk, and print straight from your room with remote printing. Stretch out on the adjustable Garden Sleep System® bed to watch a movie on the 32-inch HDTV. Great for families, spacious suites offer a sofa bed in the living room. All rooms feature a microwave and mini-fridge – pick up supplies from the 24-hour Pavilion Pantry to prepare in room, or let us do the work and deliver delicious room service straight to your door.Set up for a busy day exploring or working in the city with a cooked-to-order breakfast in our restaurant. Meet with colleagues for lunch or dinner, or simply relax enjoying drinks in the lounge. It's easy to fit in a work out during your stay – our Atlanta hotel has a fully-equipped fitness center, an outdoor pool with whirlpool, and complimentary Stay Fit Kits® to use in the comfort of your room.Keep in touch with the office at the 24-hour business center and let our professional team members help plan successful events in the 3,000 sq. ft. of meeting space. Make yourself at home in one of the 109 air-conditioned rooms featuring refrigerators and flat-screen televisions. Your pillowtop bed comes with Egyptian cotton sheets. Satellite programming and iPod docking stations are provided for your entertainment, while complimentary wireless Internet access keeps you connected. Private bathrooms with showers feature designer toiletries and hair dryers. The Hilton Garden Inn Atlanta Perimeter Center hotel is just 5 miles north of Buckhead and 10 miles from downtown Atlanta, Georgia. 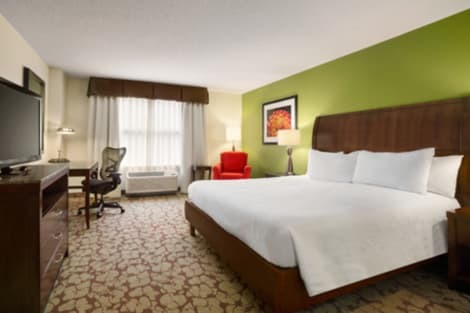 The Hilton Garden Inn hotel is adjacent to Hewlett Packard and a convenient MARTA train station is within 1 mile.Deluxe hotel accommodations, friendly service and a relaxed Georgia atmosphere await our guests at the Hilton Garden Inn Atlanta Perimeter Center hotel. Certain to please the busy executive or leisure traveler are our array of special hotel amenities including free high-speed wireless internet access, in-room hospitality center with microwave, refrigerator and coffeemaker, two dual line phones with voicemail and data ports, large work desk and ergonomic chairs, On Command video and TV video games, complimentary HBO, complimentary USA Today each weekday morning, indoor swimming pool, whirlpool and fitness center and a 24-hour complimentary business center with secure PrinterOn printing.The Hilton Garden Inn Atlanta Perimeter Center hotel offers 3,600 square feet of Atlanta hotel meeting space that accommodates up to 150 people as well as catering services. Our Hilton Garden Inn hotel restaurant, the Great American Grill, serves freshly prepared breakfasts daily. The Pavilion Pantry has a selection of refrigerated, frozen and microwaveable packaged items perfect for in-room preparation.When our Hilton Garden Inn hotel guests are ready for relaxation or some fun, the large outdoor heated pool and fitness center are available. Hilton Garden Inn Atlanta Perimeter Center hotel guests will find terrific shopping at the nearby Perimeter Mall. Access to Georgia I-400 and Georgia I-285 provides easy travel to all of Atlanta, Georgia's many attractions and corporate offices. Experience Georgia hospitality and exceptional service at the Hilton Garden Inn Atlanta Perimeter Center hotel. The Hilton Atlanta hotel boasts a central location in the heart of downtown Atlanta within walking distance of some of the best attractions in the city, including the Georgia Aquarium, CNN Center and the Georgia World Congress Center. 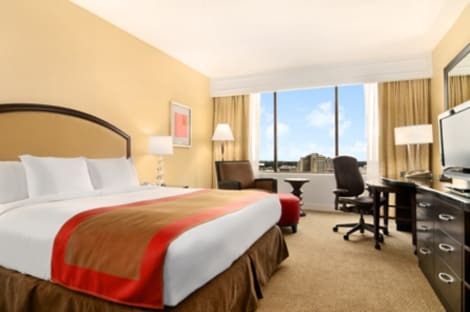 Hartsfield-Jackson Atlanta International Airport is just a 15 minute drive from our downtown Atlanta hotel.This Atlanta convention hotel offers 119,000 sq. ft. of flexible function space with the latest technology. The Grand Ballroom provides 18,000 sq. ft. of space plus an in-house technology department to help you plan the ideal meeting or event. Network and mingle over coffee in the hotel’s Grand Ballroom foyer.Swim in the outdoor pool and work out in the fully equipped fitness center. Stay fit on our downtown Atlanta hotel’s outdoor tennis courts, full-sized basketball court or jogging track. Experience fine dining overlooking Atlanta’s downtown skyline in Nikolai’s Roof restaurant or try a Polynesian cocktail at the Mai Tai bar in Trader Vic’s. Make yourself at home in one of the 40 air-conditioned rooms featuring refrigerators and flat-screen televisions. Complimentary wireless Internet access keeps you connected, and cable programming is available for your entertainment. Private bathrooms with bathtubs or showers feature complimentary toiletries and hair dryers. Conveniences include desks and coffee/tea makers, as well as phones with free local calls. Experience Southern charm, excellent food, great shopping and top attractions when you book a hotel in Atlanta, Georgia. It's the land of slow smiles and lazy Southern drawls, rich in history but wonderfully modern too. The longer you stay the more reasons you'll find to return. The city was founded in 1837 when it was the end of the Western & Atlantic railroad line. While modern life has had a major impact on the city's culture and its skyline, the old ways remain. Learn about the history of the state at the Atlanta History Centre, before checking out the galleries at the High Museum of Art. Discover the story of the city's world famous civil rights leader at the Martin Luther King National Historic Site, or get hands-on with a visit to the city's Fernbank Museum of Natural History. Here you'll find more than 100 interactive exhibits designed to bring the natural world to life for visitors of all ages. There's always plenty happening in Altanta. The main problem will be fitting everything in. Pay a visit to see the animals at Zoo Atlanta or head to World of Coca-Cola and have a go at making your own fizzy drink recipe. Take the Inside CNN Studio Tour if you're keen to learn about what goes on behind the scenes at the news broadcaster, or perhaps find time to take a walk through Stone Mountain Park where you'll be treated to excellent views of the city. When it comes to finding independent boutiques and top-name brands in Atlanta, you'll be spoilt for choice. Excellent shopping options can be found across the city, from the fashion outlets of the city's Virginia-Highland neighbourhood to Underground Atlanta shopping mall in the downtown area. You might also want to travel a few miles north of downtown Atlanta to visit the affluent district of Buckhead. Here you'll find more outstanding malls, antique shops and a huge number of boutiques and galleries. Be sure to find time to fit in Lenox Square Mall and Phipps Plaza. Food lovers will be in their element in the city, thanks to the huge selection of independent restaurants and Atlanta hotels offering top notch dining options. No matter whether you're keen to find American, French, Italian or Japanese cuisine, you're sure to find something to suit. Bone's Restaurant is a superb steakhouse specialising in prime beef and seafood, while Fandangles in the Sheraton Atlanta offers an unforgetSEOSITE_LEVEL_DESCRIPTION fine dining experience. Consider trying the exceptional sushi menu at One Flew South if you're passing through Hartsfield-Jackson Atlanta International Airport, or try and find the dessert of your dreams at Jeni's Splendid Ice Creams.